Dogs as Expert Cancer Screening Tool: New study – FIREPAW, Inc.
For the new study, researchers used a form of clicker training to teach four beagles to distinguish between normal blood serum and samples from patients with malignant lung cancer. Although one beagle — aptly named Snuggles — was unmotivated to perform, the other three dogs correctly identified lung cancer samples 96.7 percent of the time and normal samples 97.5 percent of the time. BioScentDx plans to use canine scent detection to develop a non-invasive way of screening for cancer and other life-threatening diseases. As a next step, the company launched a breast cancer study in November in which participants donate samples of their breath for screening by trained cancer-sniffing dogs. Journal reference: Junqueira, H., et al., (2019). 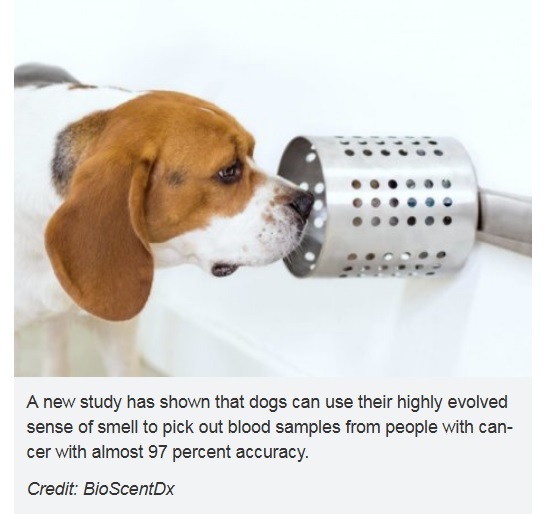 Accuracy of Canine Scent Detection of Lung Cancer in Blood Serum, FASEB Journal, Biochemistry and Molecular Biology, Abstract 635.10.